I have to admit that most of the time I love tying flies: there are those evenings, of course, after a long day on the water when the clients have eaten into the stock, and I am forced to burn the midnight oil in wet clothes when the allure wanes a tad, but for the most part that isn’t the case. 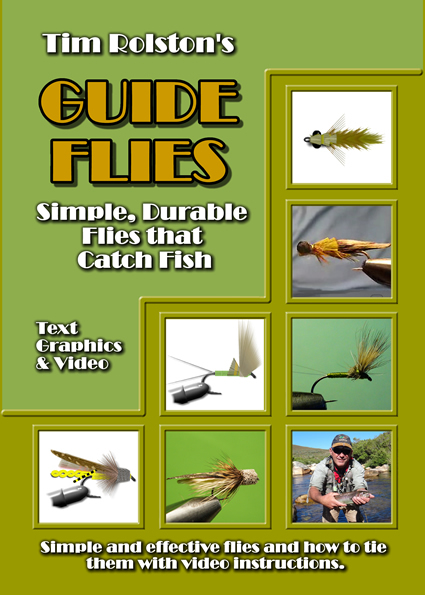 I have at different times taught fly tying, written books on fly tying and as with many of us given demonstrations of fly tying. There are a few YouTube videos out there with my name on them and I am not averse to seeing what others are up to on the fly tying front on the same forum. 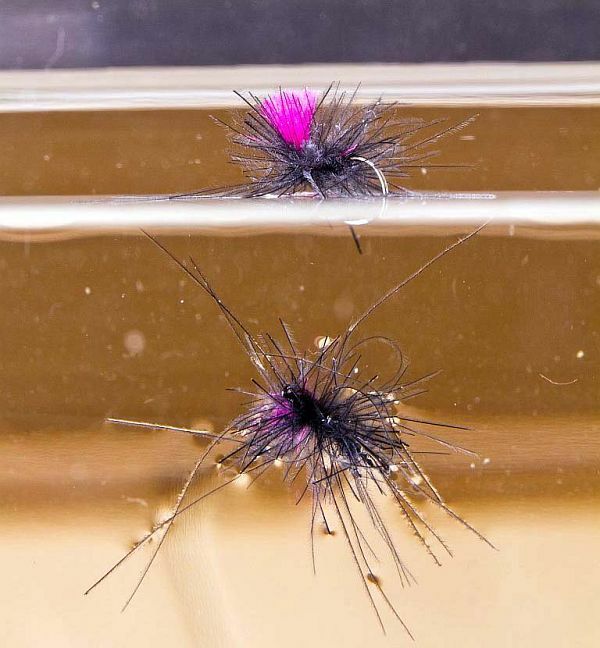 I like innovation, delicacy, and clever use of materials in fly tying, I love the intricacy of woven bodies, and even the slick shine of flies coated in UV resin. I have been known to fashion the odd ultra-realistic hopper leg or the occasional cute bass mouse when the mood takes me but all in all I like simple flies. Simple flies are frequently as effective and often more effective than their more artistic counterparts and as a fishing guide the efficacy of the pattern is more important to me than the artistic impression. When you get right down to it, effectiveness on the water, durability and speed of tying become more important when fishing provides one with an income and there is little point in whipping out patterns which take hours. The knowledge that your lovingly fashioned creation is but a wayward cast away from an ignominious end in the bankside herbage tends to have you consider the time spent on its creation. But equally one cannot escape the fact that if you are to convince your clients that you are worth your salt, it is pretty important that your flies do entice more than a few fish to eat them. Now it so happens that of late, the past week or so at least, the trout on our local streams have been unusually selective, or at least tricky and they have studiously ignored more than a few of my most lovingly wrapped dry flies. Ignored is probably the more polite term, I am not sure if trout are capable of utter distain but I could have made a reasonable argument for such over the past couple of days. You see much of the time these crystal clear, slightly acidic and nutrient poor streams tend not to produce massive hatches and the eager trout, with an appetite and a bit of attitude is likely to consume most reasonably well presented flies so long as they are not too large. But of late there have been masses of Net Winged Midges all over the place. These, to an angler, annoying little bugs , which look rather like miniature flying bicycles, all legs and not much substance, tend to fly millimetres above the surface and the fish, particularly the smaller ones , will clear the water to intercept them. That represents a serious problem of presentation as one simply cannot match the behavior and these hatches can prove to be some of the most frustrating that you will ever encounter. However of late the numbers have been so significant that there are numerous dead and drowned midges stuck in the film and the trout, accomplished predators not given over to wasting energy seem to have keyed into the bugs stuck in the film. The rises have all been nebbing breakages of the surface film with hardly a ripple to indicate the fish’s presence. I suppose that on freestone streams much of what is consumed by the trout is in fact dead, drowned and or dying and the fish happily recognise a messed up tangle of tiny fibres as food, rather putting the kibosh on notions of close copy imitation. It seems that the more straggly, the more insubstantial, the more tangled the imitation the better, but the illusion of life, or perhaps in this case recent demise holds allure that the fish find hard to resist. Unusually then over the past week or so the neatly tied, although simple, dry flies that I usually rely on have proven ineffective, but after some fiddling about, and trust me when I tell you that fiddling about on a trout stream is a very valuable skill to master, we came up with a killer solution. The fly of the moment is a CDC Soft Hackle, fashioned of little more than a pinch of dun coloured CDC and some fine (Gordon Griffiths Midge) black thread. The pattern is simplicity itself, although perhaps to the uninitiated it wouldn’t tend to provide too much confidence. As a client recently commented: “You would never be able to sell these flies in a shop”, and they are right, the darned things look far too small for a trout to take notice and far too poorly manufactured to have many anglers willingly swap hard earned cash for a dozen. Particularly when you could put twelve of them on a 50 cent coin and still have space. Insubstantial would be a gross exaggeration of their profile, this is near as dammit a bare hook with legs, but in the water it is the closest copy of those drowned midges that you could ever hope to find and attempts to make ones pattern more “meaningful” tend to reduce the effectiveness. The only real issue in fishing these flies is that they are invisible, to the angler if not the trout, and a two fly rig of a more noticeable dry fly on a dropper and the midge on the point is the only real manner to fish them effectively and have hope of spotting the take. The trout will take them in the film and you can frequently see that, so long as you know where you are supposed to be looking. Darryl Lampert also has a very effective dry fly pattern to imitate this hatch, also a CDC fly but tied as a dry with a bright indicator built in so that one can fish it as a dry on it’s own without recourse to the two fly rig we have been using with the Soft Hackle approach. To be frank, I love simple flies and simple, translucent, under-dressed, insubstantial and rather scruffy flies in particular, but even I have been astounded by the effectiveness of these patterns over the past few days. The fish simply would refuse virtually all else and then commit suicide to intercept a well presented soft hackle, it happened over and over again. I suppose that won’t last, some other naturals will take precedence in time and we will be back to the standard parachutes, Elk Hairs, Biot Caddis Flies and other favourites, but right now the fly of the moment is something you could teach your grandmother to tie after a ten minute lesson. 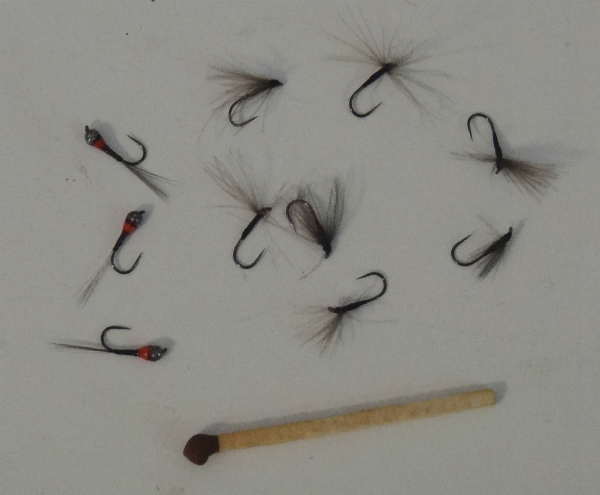 Perhaps best of all, on those evenings when I am in wet clothes, contemplating a seriously depleted fly box, lashing furiously at the vice to fill the gaps before the morrow’s outing. The simplicity is a real boon, knowing that, despite the lack of skill or time required, I shall still have a dozen really effective patterns done and dusted in time to catch the late night news. Firstly their larvae don’t look anything like what most of us consider to be midge larvae, that classical inverted question mark picture beloved of Stillwater anglers. Nope, these odd little critters have larvae with six little suckers on their ventral surface. 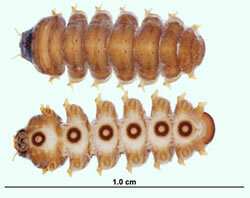 The larvae are filter feeders and the suckers help them stay put in the fast water they prefer to inhabit. The pupae are no less unusual either, the pupa emerge from the larvae and stick themselves to the rock substrate, often the larvae migrate to specific areas before this happens such that “colonies” of pupae will be found in certain areas and depressions in the rock. The pupae look like tiny dark black or brown tortoise shells, and to the casual observer don’t appear to be anything alive at all. On emergence the adults rupture the pupal case and rise to the surface in an air bubble. 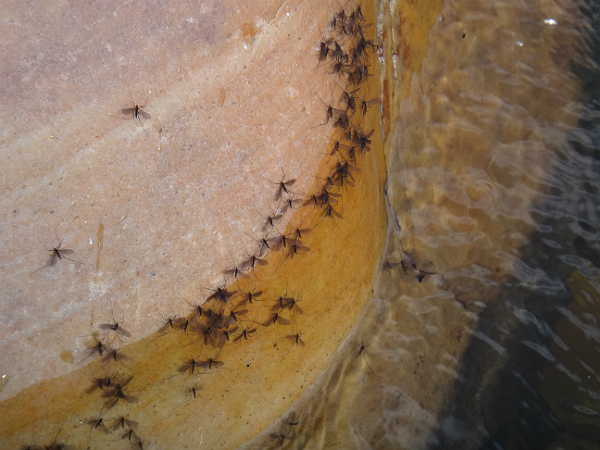 Their wings are fully formed before emergence allowing a speedy getaway on reaching the surface of the water. 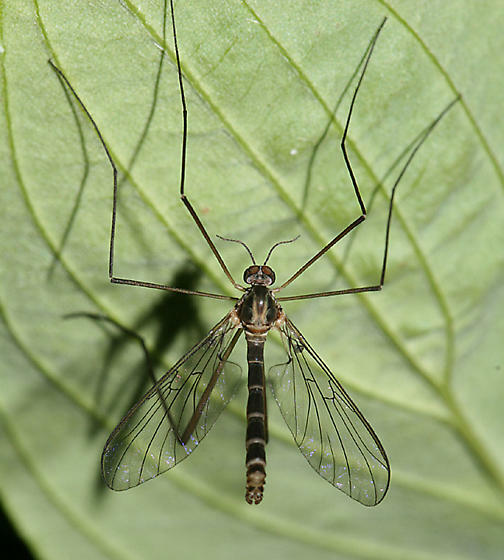 The adults appear very similar to miniature Crane Flies, with long legs dangling and relatively short wings. Currently they are appearing in their thousands on the local streams here and the fish know all about them.. Available on line from www.inkwaziflyfishing.co.za in both eBook and Paperback format. This entry was posted on October 11, 2014 at 12:19 pm and is filed under Cape Streams, Fishing, Uncategorized. You can follow any responses to this entry through the RSS 2.0 feed. You can leave a response, or trackback from your own site. I have come to realize Mark, that the trout don’t care a darn about whether one wears glasses or not. 🙂 Thanks for taking the trouble to comment.